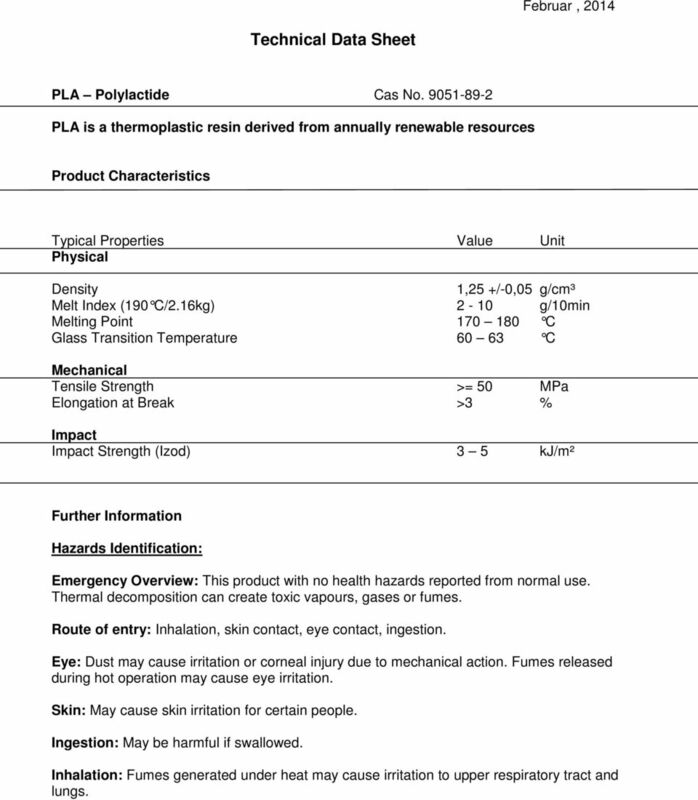 1 Februar, 2014 Technical Data Sheet PLA Polylactide Cas No PLA is a thermoplastic resin derived from annually renewable resources Product Characteristics Typical Properties Value Unit Physical Density 1,25 +/-0,05 g/cm³ Melt Index (190 C/2.16kg) 2-10 g/10min Melting Point C Glass Transition Temperature C Mechanical Tensile Strength >= 50 MPa Elongation at Break >3 % Impact Impact Strength (Izod) 3 5 kj/m² Further Information Hazards Identification: Emergency Overview: This product with no health hazards reported from normal use. Thermal decomposition can create toxic vapours, gases or fumes. Route of entry: Inhalation, skin contact, eye contact, ingestion. Eye: Dust may cause irritation or corneal injury due to mechanical action. Fumes released during hot operation may cause eye irritation. Skin: May cause skin irritation for certain people. Ingestion: May be harmful if swallowed. Inhalation: Fumes generated under heat may cause irritation to upper respiratory tract and lungs. 2 First Aid Measures: Eye Contact: Wash eyes with plenty of water for at least 15 minutes, lifting lids occasionally to remove particles. Seek medical aid. Skin Contact: Wash exposed area with soap and water. If irritation persists, seek medical attention. Remove contaminated clothing and shoes. Wash clothing before reuse. Thoroughly clean shoes before reuse. Inhalation: Remove to fresh air. If not breathing, give artificial respiration. If breathing is difficult, give oxygen. Ingestion: Not a likely route of exposure. Induce vomiting if large quantities are swallowed. Get medical attention. Fire Fighting Measures: Fire Hazard Summary: This material is flammable if being heated strongly. Extinguishing Media: Use water, water fog or foam, carbon dioxide or dry chemical to extinguish fires. Special information: As in any fire, wear a self-contained breathing apparatus in pressuredemand, MSHA/NIOSH (approved or equivalent), and full protective gear. Dusts at sufficient concentrations can from explosive mixtures with air. Combustion generates toxic fumes. Unusual Hazards: None. 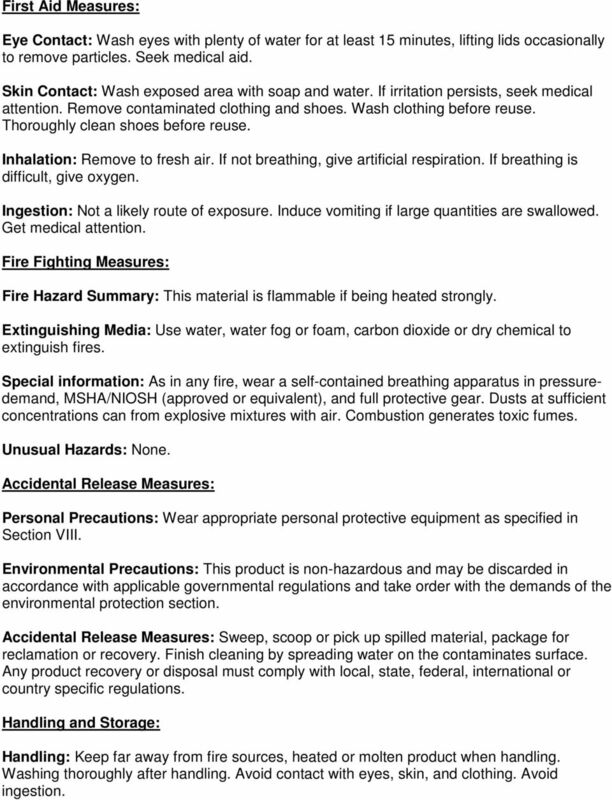 Accidental Release Measures: Personal Precautions: Wear appropriate personal protective equipment as specified in Section VIII. Environmental Precautions: This product is non-hazardous and may be discarded in accordance with applicable governmental regulations and take order with the demands of the environmental protection section. Accidental Release Measures: Sweep, scoop or pick up spilled material, package for reclamation or recovery. Finish cleaning by spreading water on the contaminates surface. Any product recovery or disposal must comply with local, state, federal, international or country specific regulations. Handling and Storage: Handling: Keep far away from fire sources, heated or molten product when handling. Washing thoroughly after handling. Avoid contact with eyes, skin, and clothing. Avoid ingestion. 3 Storage: Store in a cool, dry, and well-ventilated area and away from sources of ignition, excessive heat and direct sunlight. Keep container closed when not I use. Protect from physical damage. Separate from combustible and strong oxidizing agents. Put it lightly when packing and transport, prevent the packing and container from damage. Exposure Controls/Personal Protection: Signs and Symptoms of Exposure: There are no significant health hazards under normal conditions of use. Dust of the product may cause eyes and skin irritation. Harmful if swallowed. Prolonged breathing of vapours may cause respiratory irritation. Medical Conditions Generally Aggravated by Exposure: None known. 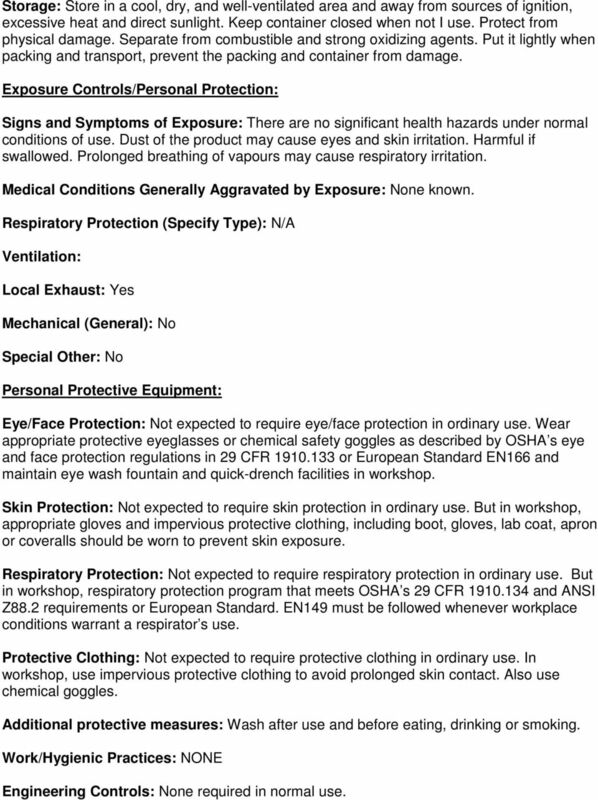 Respiratory Protection (Specify Type): N/A Ventilation: Local Exhaust: Yes Mechanical (General): No Special Other: No Personal Protective Equipment: Eye/Face Protection: Not expected to require eye/face protection in ordinary use. Wear appropriate protective eyeglasses or chemical safety goggles as described by OSHA s eye and face protection regulations in 29 CFR or European Standard EN166 and maintain eye wash fountain and quick-drench facilities in workshop. Skin Protection: Not expected to require skin protection in ordinary use. But in workshop, appropriate gloves and impervious protective clothing, including boot, gloves, lab coat, apron or coveralls should be worn to prevent skin exposure. Respiratory Protection: Not expected to require respiratory protection in ordinary use. But in workshop, respiratory protection program that meets OSHA s 29 CFR and ANSI Z88.2 requirements or European Standard. EN149 must be followed whenever workplace conditions warrant a respirator s use. Protective Clothing: Not expected to require protective clothing in ordinary use. In workshop, use impervious protective clothing to avoid prolonged skin contact. Also use chemical goggles. Additional protective measures: Wash after use and before eating, drinking or smoking. Work/Hygienic Practices: NONE Engineering Controls: None required in normal use. 4 Physical and Chemical Properties: Appearance and Odor: sweet Solubility in Water: Insoluble. Specific Gravity (H2O=1): 1.25 Melting Point: C Molecular Weight: Stability and Reactivity: Stability: The product is considered stable under normal conditions. Hazardous Polymerization: Will not occur Incompatibility Materials to Avoid: Incompatible with strong oxidizing agents. Hazardous Combustion Products: Combustion may produce carbon dioxide and carbon monoxide. Conditions to Avoid: Direct sunlight, excessive heat and physical damage. Corrosive to Metals: Not corrosive. Toxicological Information: Believed to be safe. Carcinogenicity (NTP) (IARC) (OSHA): Not listed as a carcinogen. Teratogenicity and Embryotoxocity: No human information was located. Reproductive Toxicity: No human or animal information was located. Mutagenicity: This product is not expected to be mutagenic. No human information or studies using live animals were located. Toxicologically Synergistic Materials: There is no information available. 5 Ecological Information: Environmental Toxicity: On the basis of available information, this product is not expected to produce any significant adverse environmental effects when recommended use instructions are followed. Disposal Considerations Waste Disposal Method: Put into dustbin, otherwise incineration, otherwise licensed landfill, or safe disposal as required by local, state, federal, international or country specific regulations. 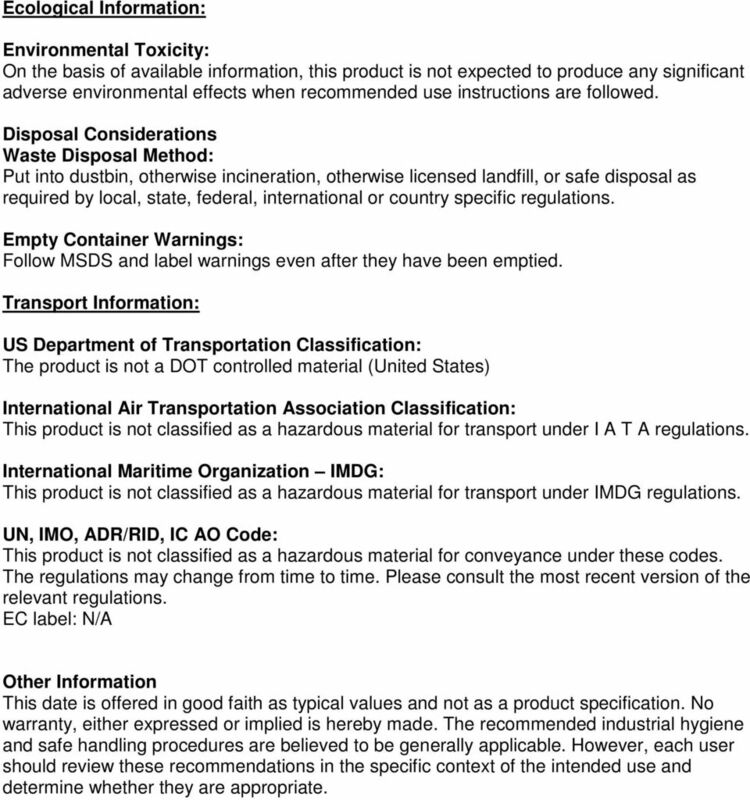 Empty Container Warnings: Follow MSDS and label warnings even after they have been emptied. Transport Information: US Department of Transportation Classification: The product is not a DOT controlled material (United States) International Air Transportation Association Classification: This product is not classified as a hazardous material for transport under I A T A regulations. International Maritime Organization IMDG: This product is not classified as a hazardous material for transport under IMDG regulations. UN, IMO, ADR/RID, IC AO Code: This product is not classified as a hazardous material for conveyance under these codes. The regulations may change from time to time. Please consult the most recent version of the relevant regulations. EC label: N/A Other Information This date is offered in good faith as typical values and not as a product specification. No warranty, either expressed or implied is hereby made. The recommended industrial hygiene and safe handling procedures are believed to be generally applicable. However, each user should review these recommendations in the specific context of the intended use and determine whether they are appropriate. 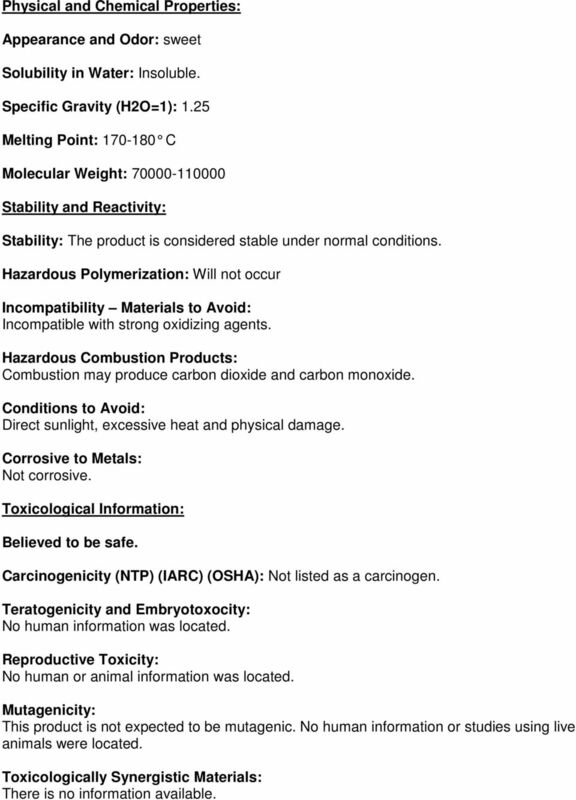 MATERIAL SAFETY DATA SHEET SECTION 1: IDENTIFICATION OF MATERIAL AND SUPPLIER SD169 SYN-1079 1H-indole-5-carboxamide CAS Registry No. : 1670-87-7 Supplier: SYNkinase Level 4, Building 21A, 528 Ruiqing Rd.